Born: 1885, Christchurch, London, Middlesex. Died: 18th May 1915; age 30; Died of Wounds at General Hospital, Versailles. Wounded in Action on the 14th May 1915. Served 11 years & 85 days. Enlistment Details: Ipswich, Suffolk on the 23rd January 1904; age 19 years; Occupation Clerk; Religion: CofE. Height: 5ft 5 3/4ins, complexion fresh, blue eyes and dark brown hair. Promoted from Private to Lance Corporal 30th October 1909; from Lance Corporal to Corporal 2nd August 1912. Accident – 21st June 1906 – he was leading a troop horse out grazing, which was frightened & turned & kicked him in the forehead. He was in no way to blame. Regiment: Royal Engineers, 1st Field Squadron. Relatives Notified and Address: Walter Brewster, 177, Cemetery Road, Ipswich. Brother to HARRY EDMOND BREWSTER & HAROLD FREDERICK BREWSTER. 1891 Baker’s Shop, Dogs Head Street, Ipswich. Ernest was 5 years old and living with his parents & siblings. Walter Henry Brewster, 46, a Baker & Confectioner – an employer, born Carton Colville, Suffolk. Jane Brewster (nee Morphy), 36, born Ipswich. Ellen Brewster, 16, a Confectionery Assistant, born Ipswich. Agnes Louisa Brewster, 12, born Ipswich. Gertrude Emily Brewster, 10, born Ipswich. Albert William Brewster, 8, born Great Bromley, Essex. Edith Eliza Brewster, 4, born Ipswich. Arthur Charles Brewster, 2, born Ipswich. Alfred Brewster, 1, born Ipswich. Ernest was 16 years old, a Commercial Clerk. He was living with his parents & siblings. Walter, 57, a Baker – own account. Gertrude, 20 a Dressmaker – own account. Albert, 18, a Corn Miller. Harry Edmond Brewster, 9, born Ipswich. Harold Frederick Brewster, 7, born Ipswich. Ernest is also remembered on the war memorial at St. Margaret’s Church, Ipswich and on his parents headstone at Ipswich Cemetery. Mr. and Mrs. J. Brewster, of Cemetery Road, Ipswich, have six sons and one son-in-law serving in the Army, their regiments being as follows:- (1) Herbert Walter Brewster, M.T., A.S.C., prior to joining up he was employed at Burton, Son and Sanders, Ipswich: at present serving at home. (2) Albert William Brewster, A.O.C., serving in France, prior to joining up was employed at Thos. Mortimer, Ltd., maltsters, Ipswich. (3) Ernest George Brewster, R.E., 12 years’ service, was sent out to France beginning of war, and killed May 18th, 1915. (4) Arthur Charles Brewster, Royal Sussex Regiment, prior to joining up was employed by Mr. Parker, decorator, Ipswich. 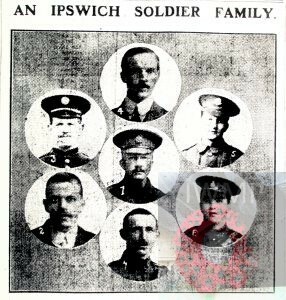 (5) Harry Edmond Brewster, Middlesex Regiment, prior to joining up was employed at the International Tea Stores, Ipswich. 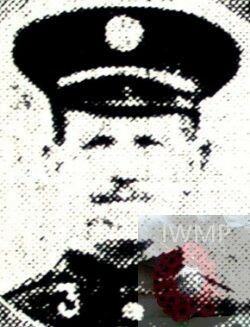 (6) Harold Frederick Brewster, R.F.A., prior to joining up was employed as footman in London, he was killed September, 1917. (7) Sadler-Corpl, Charles Tevendale (son-in-law), 16 years’ service, R.H.A., has served in France since August, 1914.